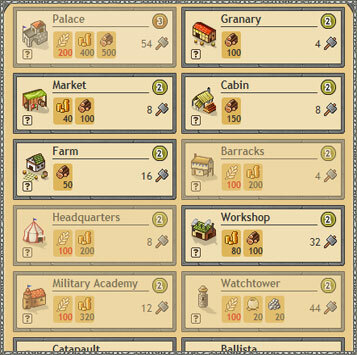 Once you've recruited a worker, you'll be able to start constructing buildings. Constructing a building requires resources ( Wood, Gold, ...) and also requires a certain number of hammers . You can only construct one building at a time, but you can cancel the construction of a building at any point, in which case you'll recover any resources used during construction. The first building you must build is the Palace. Once your palace has been built, you'll then be able to start constructing other buildings. Tip : It will be much easier to increase your capital's population if your food stocks are more than the square of your population. For example, if you have a population of 9, you must have (9x9) = 81 food stocks. Don't forget to improve your granary so that you can store more food. Once a building has been completed, you can then upgrade it to the same level as your Palace. For example, in order to have a Level 3 Barracks, you must first have a Level 3 Palace. Each level upgrade requires a specific Title. A complete list of buildings and costs of each upgrade is available on this page.